The late, great Giuseppe Quintarelli, succeeded in establishing his mythical and legendary estate during an amazing sixty-year career. Quintarelli’s wines express the tradition, love, heart, and soul of the terroir in the hills of Verona. Giuseppe’s daughter Fiorenza, his son-in-law Giampaolo, and his grandsons Francesco and Lorenzo are all keeping a close watch over the family’s legacy and to this day, Giuseppe Quintarelli remains one of the icons of Italy. The wines are released only when deemed ready, not a moment sooner. 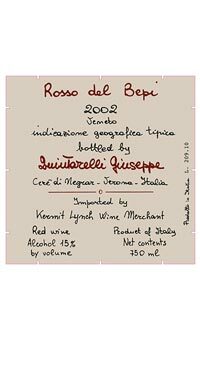 The Rosso del Bepi is a blend of 55% Corvina and Corvinone, 30% Rondinella, 15% Cabernet Sauvignon, Nebbiolo, Croatina and Sangiovese. This wine is essentially a declassified Amarone. The grapes are hand harvested and left to dry in wooden boxes or rush mats as in traditional Amarone production. The grapes are usually pressed at in January after the development of noble rot on the dried grapes and after a 20 maceration, alcoholic fermentation begins with indigenous yeasts. Fermentation lasts 45 days and the wine is then racked and aged in Slavonian oak barrels for 7 years. Alcoholic fermentation continues during this period, so the result is a dry wine that is concentrated, rich and powerful.